Uses are cut gaskets, cushioning, weather stripping, insulation, vibration damping, or other general sealing applications where resistance to moisture or irregular surfaces are required. Material can be sponge rubber where a compression is required or a solid rubber where a very firm, solid feel is required. 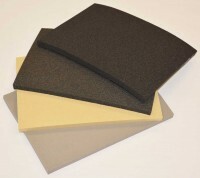 Either sponge or solid rubber can be blended using Neoprene, Vinyl Nitrile, SBR, EPDM, EPT, EVA, Cork, Cork and Rubber, or Silicone. Bothe sponge and solid are available in a variety of firmness. There are a number of types to fit most applications and temperature ranges. The material can be purchased in sheets or rolls and is easily fabricated to shapes. Pressure sensitive adhesive (peel and stick) can be applied when needed.